The boy's behaviour...: Meal or memory? I've been trying to think about recipes and which ones are important to our family. There are quite a few - the tomato sauce recipe that I use in all sorts of things, important as it saves me time, it's cheap, versatile and the kids like it...a lot; the coveted family Victoria Sponge recipe which only my lovely Nannie has managed to perfect, she always has one on the table when we visit, and we always bring home the leftovers. I've never been able to make it like hers; the Devil's Food Cake recipe (a Nigella one I think) that Mini adores and will regularly ask for especially on special occasions. He also enjoys helping and licking the bowl; or my American Style Pancakes - always requested on lazy Sunday mornings, for pancake day, or sometimes a treat dinner. Always served with maple AND golden syrup, lots of berries, chocolate spread, whipped butter, slices of banana, and squirty cream and far superior to daddy's 'normal' pancakes which both Mini and Dollop refuse to eat. There are more too - special because of the occasion we were celebrating, or because of the fun had making it, some are important because they are a regular feature in our diet, or sometimes because of the exact opposite - a treat, something special that we all enjoy occasionally. I think what's important to me is not necessarily the recipe itself - which is just as well as I have a tendency to...tweak, but the feelings that are evoked by food. Food memories are strong - how many of you remember that special holiday because of the paella you ate in that little back street restaurant? Or perhaps it was your first date with your partner and the bottle of wine you had with the pasta? Maybe you were always made to eat your cauliflower and it put you off for life? Granny's apple pie? For me, I have strong food memories associated with visits to my nannie - there were always dairylea triangles and sliced beetroot at the buffet style lunches, oh, and the cucumber (grown by granddad) had the skin removed, there was always lemon meringue for pudding and a block of icecream with wafers, then we'd have the legendary Victoria Sponge for tea later...the way the table was laid was important, with proper cake forks, and even now, no-one else is allowed to sit in 'my chair' at the table! I hope that through food I can make those kind of memories for my children - it's not just the taste of that tangy tomato sauce, but the smell of tomatoes bubbling away, mingled with the freshly crushed garlic and herbs, then later the fun of grating some fresh parmesan, snow-like, over their pasta that I want them to remember. And with the chocolate cake - it's not all about eating a rich, indulgent, naughty treat, but about the tradition of the cheeky piece of chocolate that Mini always sneaks into his mouth as he helps break up the bars, and about how much he laughs when he turns the hand mixer on too fast and we get splattered in cocoa and flour, and how I always 'accidentally' manage to get icing on my fingers when I cut a slice...so have to lick my fingers. For many of our children they've not had the pleasure of good food, for some they've not even had access to the bare minimum to keep them safe, healthy and developing. Mini, despite his sometimes inappropriate diet at times in his past, has always been fed, and has never gone hungry. I don't want him to become complacent about where his food comes from, but I do want him and Dollop to enjoy their food and realise that it's not all about sustenance. 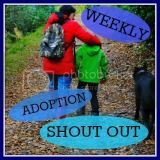 I'm linking this post up to the Weekly Adoption Shout Out at The Adoption Social. Commensality lies at the hub of humanity, the home, the family, the community, the heart. I love this post so much; it speaks of those important things tat stitch lives together; traditions, habit, cycles, repetitions. Most of all - sharing. I'm glad I read your post, it has recalled memories from my past and I agree that food holds important memories for us all. Your comments have challenged me to remember the importance of cooking/baking and sharing happy times over food with the family - thank you!